Tour Guide in Brooklyn, New York. 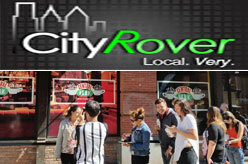 Founded in 2010, NYC Walking Tours by CityRover. Personalized Private Tour guide in New York City. Offers small group tour – Landmark Explorer, Brooklyn Bridge tours, Central Park tour, Historic NYC Downtown and Wall Street tour etc. – Art in the City Tour (NYC Street Art & Neighborhood History Tour With Guide/Artist). 3-hr walking tour – Price $45. – Downtown Highlights (From Statue of Liberty and Ellis Island to Wall Street and 9/11 Memorial). small group 3-hr walking tour – Price $45. – City of Dreams Tour (Walking & Tasting Tour of the East Village & Little Italy). Tour price $45. – Landmark Explorer (Grand Central to Rockefeller Center Midtown “Must See” Tour). Tour price $45. – Central Park Tour (Explore Manhattan’s Man-Made Masterpiece and Escape the City). Tour price $45. – The Village Sampler (High Line to Washington Square With a Slice of Pizza in the Village). Tour price $45. – Brooklyn Bridge Tour (Cross The Bridge & Explore Dumbo, Brooklyn Bridge Park and Brooklyn Heights). Tour price $45. - Full Day Tour of Midtown Manhattan and Central Park (Combines Landmark Explorer & Central Park Tour). Tour price $72. - Full Day Tour of Downtown and Brooklyn (Combines Downtown Highlights & Brooklyn Bridge Tour). Tour price $72. - Full Day Tour of Lower Manhattan (Combines the Village Sampler & City of Dreams Tour). Tour price $72. Brooklyn, New York 11215, United States.